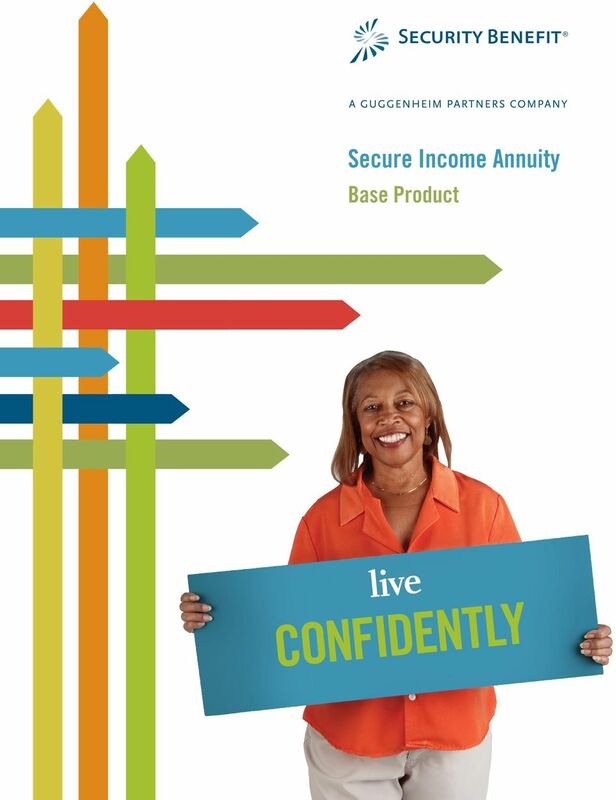 Download "Secure Income Annuity. Base Product. 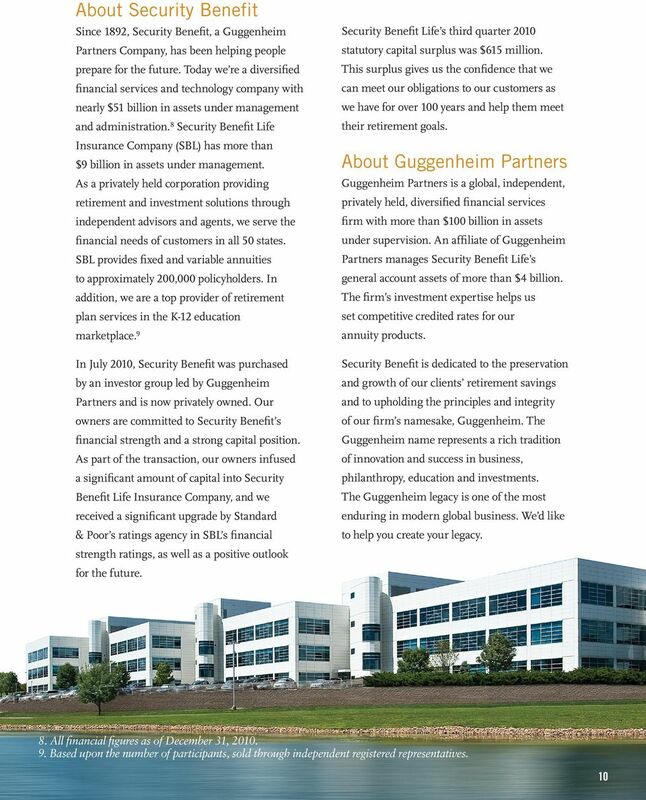 live CONFIDENTLY"
12 A GUGGENHEIM PARTNERS COMPANY One Security Benefit Place Topeka, KS IM /01/27 This brochure contains highlights only. 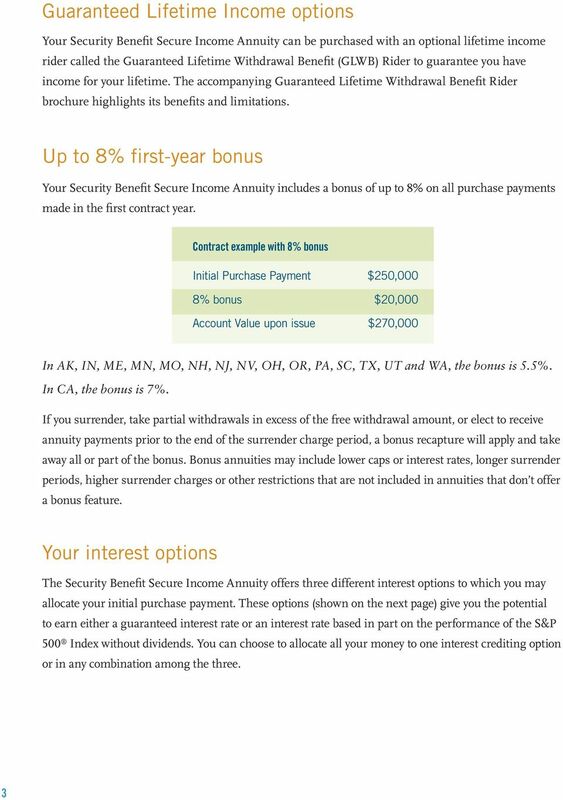 Please refer to the annuity contract for a full explanation of the product and any charges or limitations. 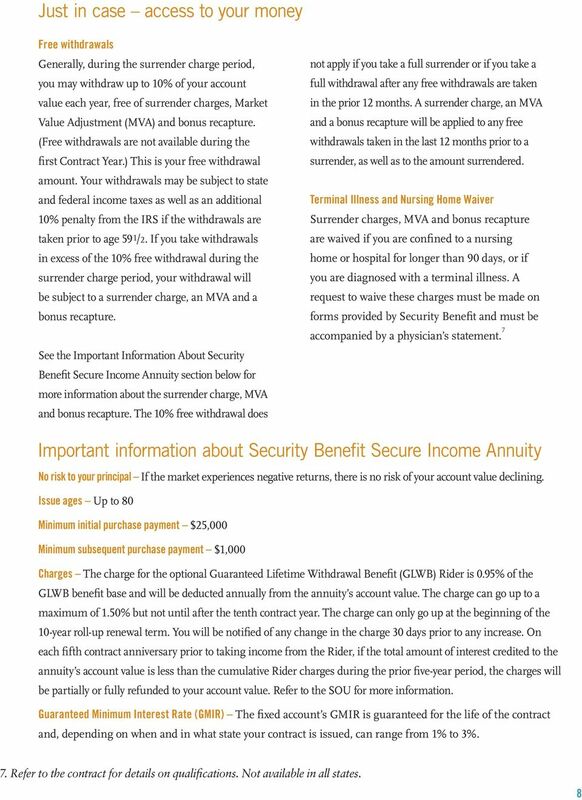 The Security Benefit Secure Income Annuity (Form 5800 (11-10) and ICC (11-10)), a fixed index flexible premium deferred annuity contract, is issued by Security Benefit Life Insurance Company. 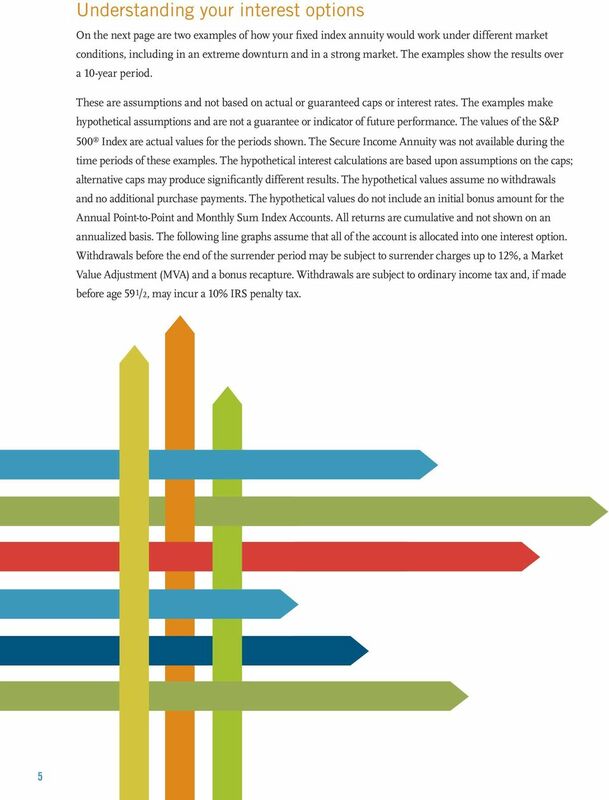 Product features, limitations and availability may vary by state. 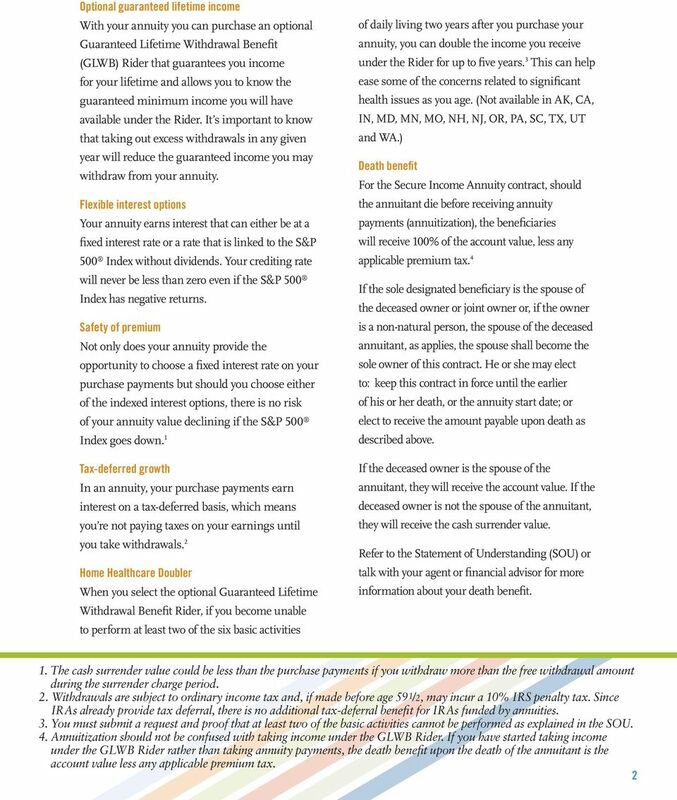 Guarantees provided by annuities are subject to the financial strength of the issuing insurance company and: ARE NOT A DEPOSIT ARE NOT INSURED BY ANY FEDERAL GOVERNMENT AGENCY MAY GO DOWN IN VALUE Standard & Poor s, S&P, S&P 500 and Standard & Poor s 500 TM are trademarks of Standard & Poor s and have been licensed for use by Security Benefit Life Insurance Company. 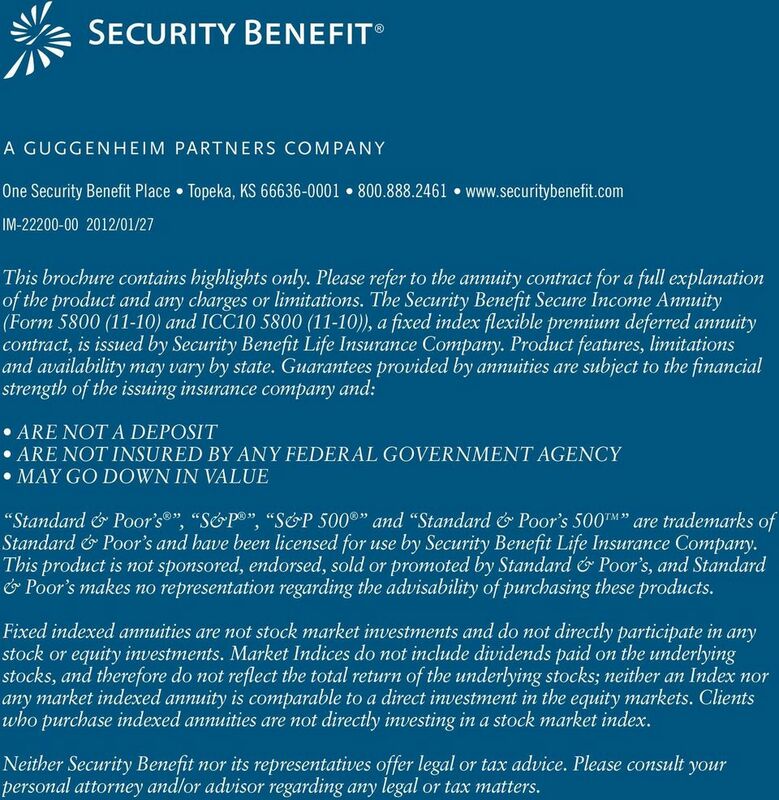 This product is not sponsored, endorsed, sold or promoted by Standard & Poor s, and Standard & Poor s makes no representation regarding the advisability of purchasing these products. 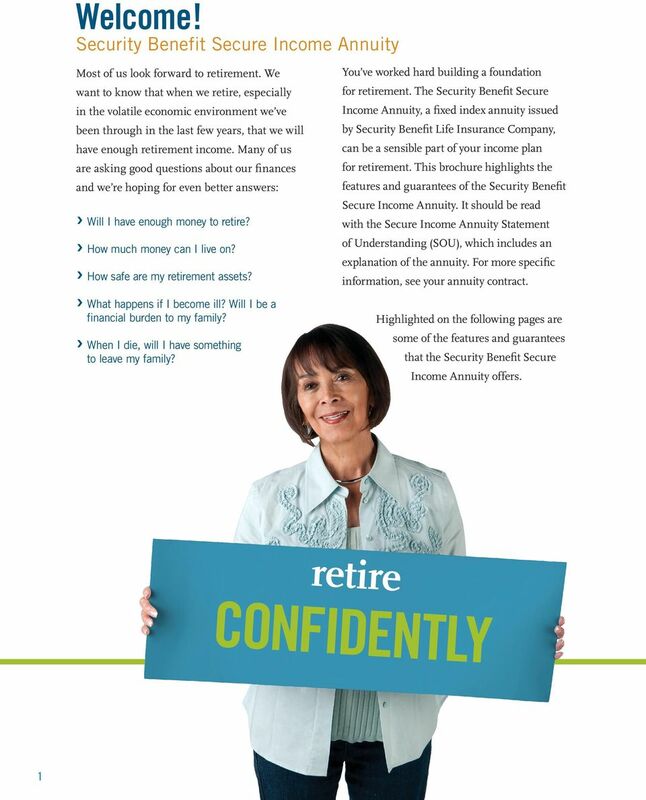 Fixed indexed annuities are not stock market investments and do not directly participate in any stock or equity investments. 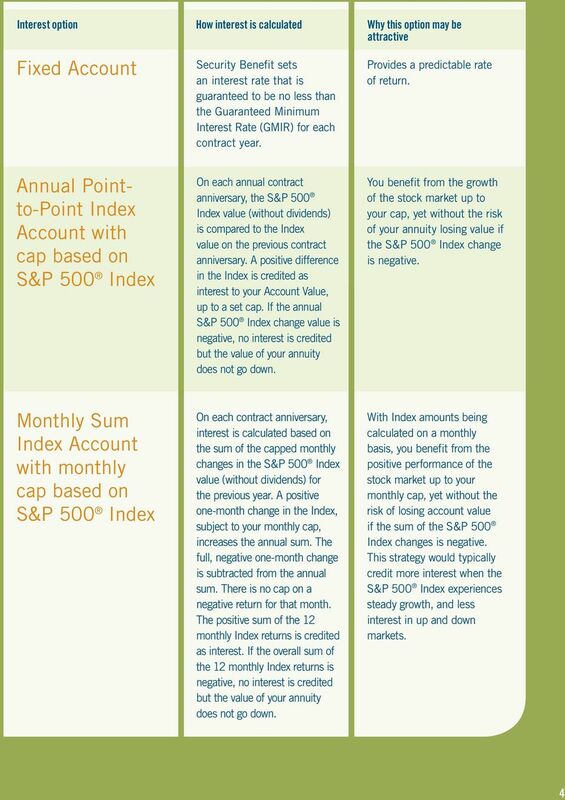 Market Indices do not include dividends paid on the underlying stocks, and therefore do not reflect the total return of the underlying stocks; neither an Index nor any market indexed annuity is comparable to a direct investment in the equity markets. 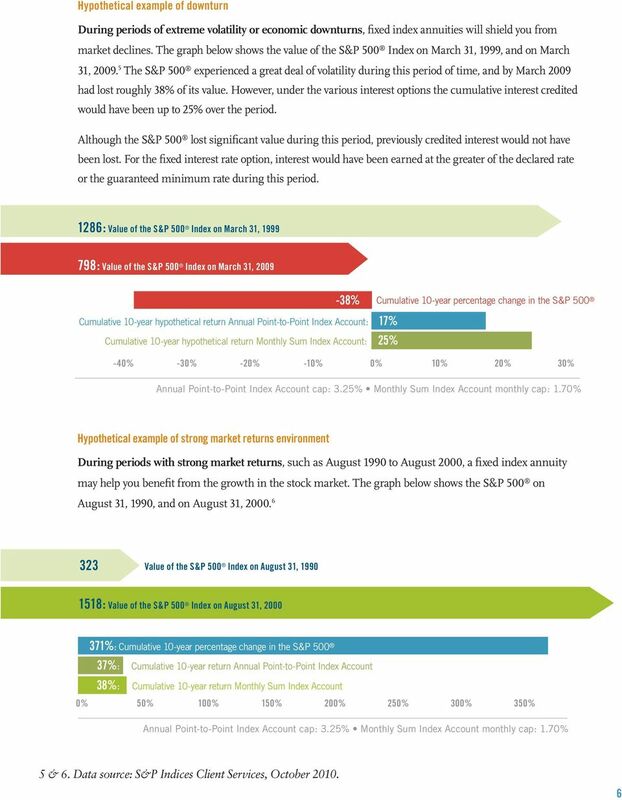 Clients who purchase indexed annuities are not directly investing in a stock market index. 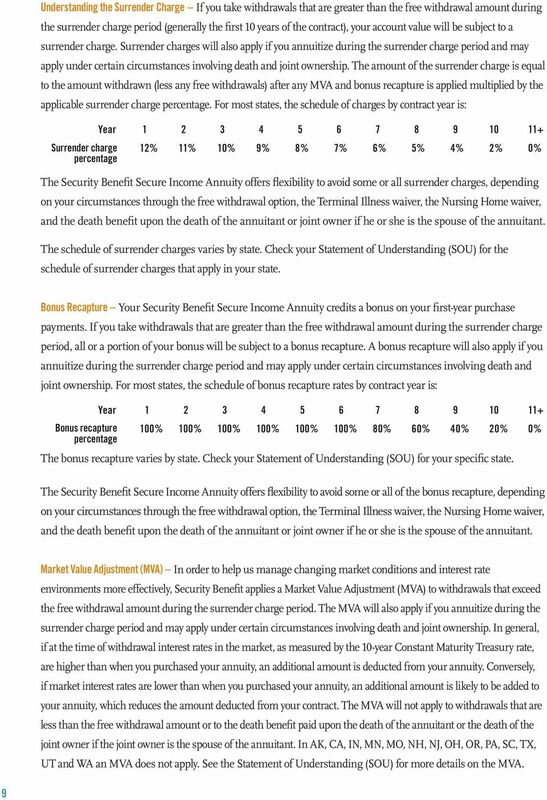 Neither Security Benefit nor its representatives offer legal or tax advice. 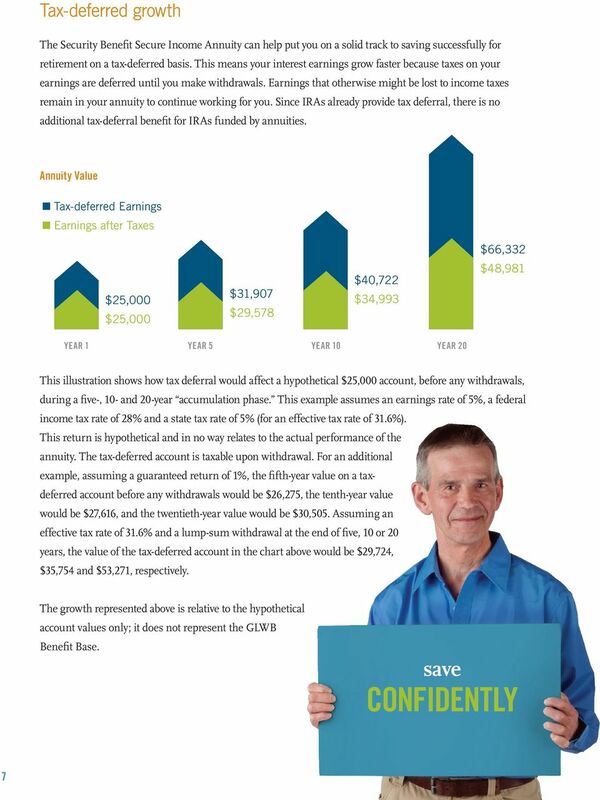 Please consult your personal attorney and/or advisor regarding any legal or tax matters.